Buy an EP, support Baby Safe! Our friends at Cardiff Vineyard have released a new EP of worship music! 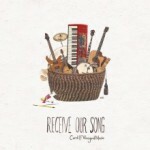 Receive Our Song documents the songwriting and worship in their community over the past few years. As if that wasn’t enough to get you placing your order, they’ve decided that 50% of all profits from the sale of the EP will go towards the work of Baby Safe!